Everyone is a critic when it come to other people’s driving, but sometimes, on very rare occasions, someone stopping their car in front of you, exiting their vehicle, and walking towards you isn’t the beginning of a shouting match and fight. Sometimes, like in the case of this young driver in Australia, it’s the beginning of a compliment. “I highly commend you,” the woman tells the driver, after thanking him for not being a “moron,” or “drunk,” or “on drugs,” or “driving like a bloody hoon,” which, indeed, are all good things. 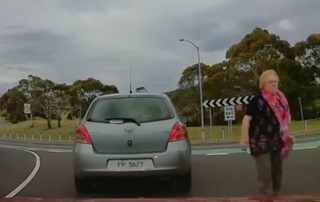 She must have spotted the driver’s “Provisional plates” which all new drivers must display on their cars in Australia. According to 1 News Now, the driver is named Josh. Well Josh, you just experience whatever the opposite of road rage is, be sure to pay it forward.